Portable induction cooktops are becoming all of the rage in our complicated and fast-paced world. Maybe you don’t want a full-sized kitchen appliance, maybe you want to boil water in your living room, or maybe you want to be able to cook something when you’re not at home. Whatever your need for an induction cooktop is, you obviously want the best one that your money can buy, not to mention for the best price too. Let’s get right to it and compare some of the best induction cooktops out there. 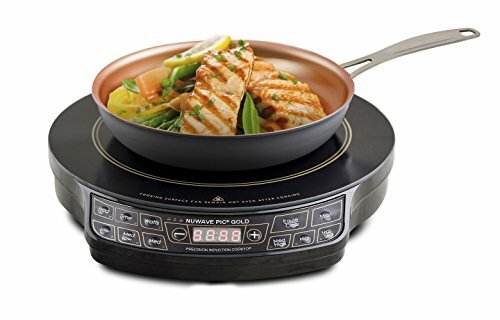 NuWave makes some great cooking and kitchen-related products, with the PIC Gold Precision Induction Cooktop being one of the more recent additions to the lineup. Let’s talk about what makes this model such a steal. The PIC Gold Precision Induction Cooktop features a 1500-watt burner, which is actually quite impressive for such an affordable cooktop. Moreover, this model has the ability to cook foods at temperatures ranging from 100° Fahrenheit to 575° Fahrenheit, which is a huge temperature range. Also, you can choose from 6 preset temperature settings, or you can also cook at 52 different temperatures between 100° and 575° in 10° increments. This will allow you to do everything you can do on a full-sized kitchen cooktop. Cook, sear, grill, boil, simmer, and everything in between can be done with the PIC Gold Precision Induction Cooktop. The PIC Gold Precision Induction Cooktop features a programmable memory, which means that you can create specific settings and the cooktop will remember it for the next time. That is what we call a convenience factor. We like the fact that the PIC Gold Precision Induction Cooktop features a 20% larger cooking surface than another model, the PIC2, plus it has a bigger surface than many other portable induction cooktops have in general. This will allow you to use some of the biggest pots and pans that you have in your arsenal. Next, the PIC Gold Precision Induction Cooktop is very lightweight and portable. Now, it is not the smallest or sleekest of all portable induction cooktops, but it does save much more space than a full-sized kitchen appliance, not to mention that you can actually carry it around with just one hand. You might like the fact that this model is 70% energy efficient, or in other words, it uses up to 70% less energy than other cooktops out there. There is also the fact that it has a shutoff feature which turns the burner off when cooking time is completed. The PIC Gold Precision Induction Cooktop comes with a timer, plus it has a delay function so you can tell it to start cooking at a certain time. This item remains cool to the touch, making it safe to touch with your hands, plus it won’t start a fire, and it does not create stuck-on messes either. In all reality, this is the better model between the two for a few different reasons. This one, the Titanium, is more expensive than the Gold version we just looked at above. However, if you are willing to spend a little more money, you also get some better features. This is not to say that both models are not top of the line, but the Titanium simply has some extra features you might appreciate. The NuWave PIC Titanium Induction Cooktop features an 1800 watt burner, which is powerful enough to boil a pot of water in 1 minute flat. That is indeed very impressive. This model has extremely good temperature adjustability. It can go anywhere from 100° to 575° Fahrenheit without issue. 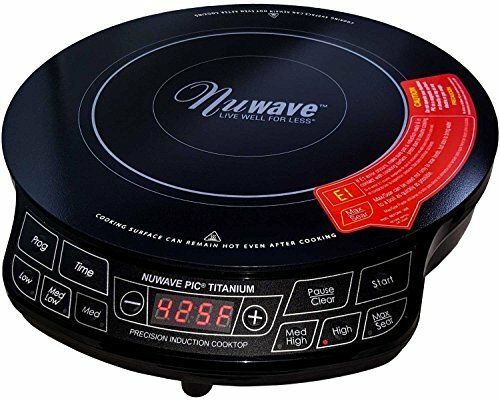 The NuWave PIC Titanium Induction Cooktop lets you choose from up to 94 precise 5° increments between 100° and 575° for very accurate cooking temperatures. What is pretty cool about this model is that it has a delayed-shutoff feature. Most other models require you to turn them back on after you remove the pot, but this one will stay active and restart on its own for up to 10 seconds after removing the pot. Also, it still has the automatic shutoff feature which makes portable induction cookers so safe. It also has the delay function so you can set it to start cooking, even if you are not in the room. You might also like the fact that the NuWave PIC Titanium Induction Cooktop has a 12.3” cooking surface, which is roughly 20% larger than the PIC Gold discussed above. Using big pots and pans with this induction cooker is no problem at all. The NuWave PIC Titanium Induction Cooktop is very durable, especially because it can handle a whopping 50 pounds of weight. The lifespan for this item is estimated to be up to 15 years, which is very impressive, no doubt. This model also comes with a high- and low-voltage warning system, plus a diagnostic error display feature as well. This is all shown on the easy-to-use digital display which the NuWave PIC Titanium Induction Cooktop features. So, as you can see, the PIC Titanium is going to cost you a little more, but it also has more functionality, durability, and better features too. The Titanium, while it has the same temperature range as the Gold, has much smaller temperature increments, making it much more accurate and reliable for various cooking jobs. The Titanium also has an 1800-watt burner, whereas the Gold only has a 1500-watt burner, making the PIC Titanium much faster. There is also the fact that the Titanium option allows for much larger pans than the Gold. That being said, both models are cool and safe to touch; they are both small and portable; and are both very energy efficient. The real difference lies in the fact that the PIC Titanium has much better temperature control options than the PIC Gold, a higher weight limit, plus it has a few other features such as the error and voltage warning systems, which the Gold does not come with.